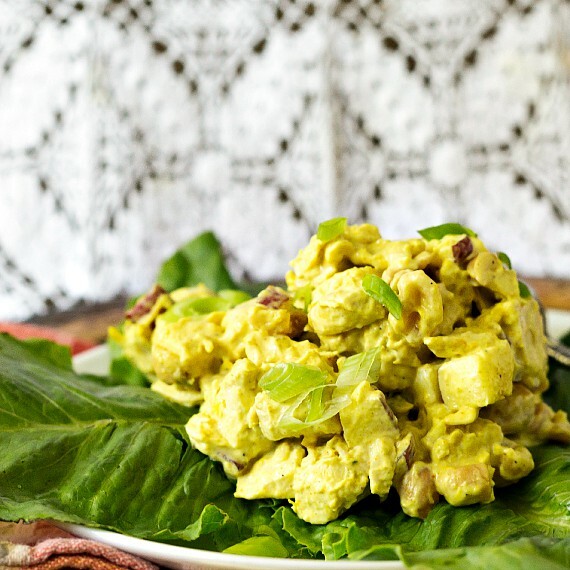 If you love curry and a sweet-salty combination, you are going to love this coronation chicken salad. So delicious and hard to stop eating! The College Kid came over for dinner on Monday evening. Originally, I had thought to make pizza for us, but since the temperature soared to 100F I scrapped the pizza idea. The poor air conditioner was working hard enough as it was. Instead, we had salads: an old school iceberg wedge salad, my Mom-Style Macaroni Salad to which I added the last of the sweet peppers that have been living in my Oxo GreenSaver (5 weeks of perfect peppers!) and curried chicken salad. And then something interesting happened. 1 Hey, Isn’t That Coronation Chicken Salad? Hey, Isn’t That Coronation Chicken Salad? I didn’t refer to a recipe for the curried chicken salad. I just added some curry-ish ingredients and made a dressing spiked with curry powder. It was delicious, so I decided to write it up. As a teaser, I shared a photograph of it, and my friend Deon from Food Jam asked if it was like Coronation Chicken Salad. This was the first time I’d ever heard of Coronation Chicken, so I went and looked it up on The Google. Chicken, fruit, curried dressing. I told him that it was indeed more or less the same thing as Coronation Chicken, and then I started doing some research into the dish. As you can guess, Coronation Chicken (really just a schmancy curried chicken salad) was invented in celebration of Queen Elizabeth’s coronation. The dish was developed by Constance Spry and Rosemary Hume, both of Le Cordon Bleu culinary school in London. The dish not so subtly paid homage to the contracting British Empire, borrowing some flavors from India, the “crown jewel of the British Empire” until 1947. Over the ensuing years, it seems that Coronation Chicken lost some of its luster, ending up in soggy sandwiches on buffet lines and being made fun of in the way that Spam is made fun of in the US. Except in Hawaii. It became something of a wink and a nod recipe. I imagine British hipsters eating it ironically. Honestly though, a good curried chicken salad made with mild, juicy chicken punctuated by pops of chewy fruit and bathed in a silken saffron-hued dressing is a beautiful thing. The British seem to think so, too. The dish seems to be making a comeback in the UK, getting updates in both the cooking method and ingredient list. It has also been kept alive with updates called “Jubilee Chicken,” commemorating Elizabeth’s fifty and now sixty years (and counting–sorry, Charles) on the throne. So now, for Throwback Thursday Food, here is my unintentional but tasty take on a Coronation Chicken Recipe. Stay tuned after the recipe for links to some authentic British versions of the dish. Sound good to you? Please rate it! 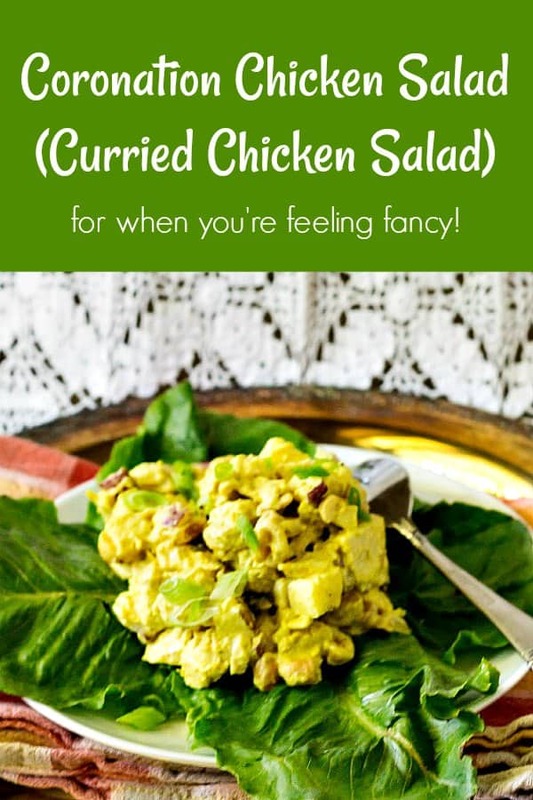 Savory and sweet coronation chicken salad is punctuated with bites of crisp apples, chewy raisins and crunchy/creamy cashews all bathed in a mild, sunny yellow curry sauce. Whisk the stock, salt, pepper and turmeric together in a pot just large enough to hold the chicken. Place the chicken in the pot. Cover and bring to a simmer. Keep the chicken at a low simmer until the internal temperature of the breasts is 165F. You may need to flip the chicken with tongs a couple of times to make sure it cooks evenly. Allow the chicken to cool in broth and then chill until cold. Cut into bite-sized pieces and set aside. Whisk all the ingredients together. You may need to adjust the salt, sweetness, acidity and/or spice, so taste and adjust accordingly. Thoroughly fold the dressing together with the chicken and all the mix-ins. Taste and adjust seasonings if necessary. Refrigerate for at least a couple of hours or overnight to let the flavors meld. Serve on lettuce/mixed greens as a salad or on a sandwich. Enjoy! If you are not a mayonnaise fan, substitute all or part of the mayo with Greek yogurt or sour cream. 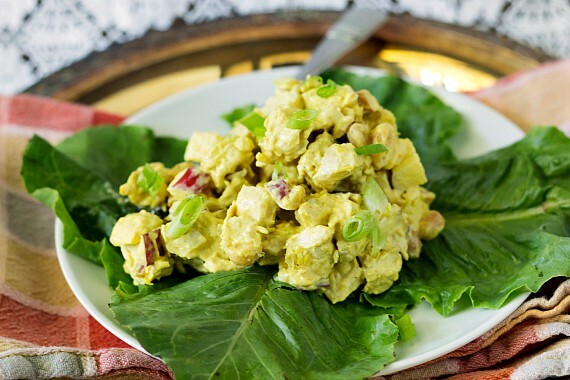 I didn't do this, and I didn't see any other recipes that did either, but I think this chicken salad would be excellent made with some of the thick "cream" from full-fat coconut milk substituted for some of the mayonnaise. Thanks, Deon, for innocently asking if what I made was Coronation Chicken because I love learning. And thank you all for taking the time to read. The chicken salad is truly lovely. The College Kid enjoyed it very much and even took some home with her. 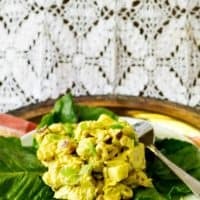 If you decide to make this coronation chicken salad, please let me know in the comments how you enjoyed it. I love hearing from readers! So glad you learnt something Jenni. I am off to buy a chicken to roast to make up a batch of coronation chicken. It really is delicious. Huzzah, Deon! I learn so much from you! Sounds really yum! I should have adjusted my meal plan this week to have some no-heat-required dinners! Maybe I’ll switch things up and make this tonight. I’m sure it won’t have quite the same oomph if I use leftover grilled chicken, but I imagine it will do fine. Thanks for the idea! Great use of leftovers, and that way there’s no cooking at all. Win-win, in my book! British hipsters and poor Charles―another terrific post (and recipe) which takes us back in time for a mini history lesson and reels us back to present day with a resurgence of the dish. Pinned! I love curry in chicken salad! This sounds like a perfect recipe to whip up this weekend! I think I’ll sub dried cranberries for raisins since I keep cranberries on hand. Yum, yum! Thanks Jenni!